The 3rd ICAAI 2019 is to be held in Istanbul, Turkey during October 26-28, 2019. Call for papers now! 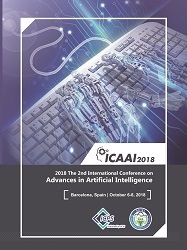 The ICAAI conference was held in Barcelona successfully during Oct. 6-8, 2018. Special appreciation extends to distinguished speakers and all committee members. The secretary will mail you linkage for download pictures. Please check your mail box on time. ICAAI 2019 conference committee sincerely invite you to take part in 2019 The 3rd International Conference on Advances in Artificial Intelligence (ICAAI 2019) in Istanbul, Turkey during October 26-28, 2019. It's co-organized by Bahcesehir University, Turkey, Science and Engineering Institute, USA, supported by Northumbria University, UK, The University of West of England, UK etc. ICAAI is the premier forum for the presentation of technological advances and research results in the fields of artificial intelligence. The conference will provide a valuable opportunity for researchers ,scholars and scientists to exchange their ideas face to face. We have the strong organization team, dependable reputation and wide sponsors all around the world. It will bring you an unexpected harvest. We welcome you to be a member of our big family. We're looking forward to your attendance in Istanbul, Turkey. .Honorable authors are cordially invited to contribute their research papers. All papers submitted to the conference will be subjected to the rigorous peer-review process. For accepted papers, it will be published in the Conference Proceedings, which will be indexed by Ei Compendex, Scopus and other academical databases. You're welcome to submit abstracts for presentation. But abstracts are only used for an oral presentation and will not be published in the conference proceedings. Index: successfully EI Compendex and SCOPUS etc. Copyright © 2019 The 3rd International Conference on Advances in Artificial Intelligence. All Rights Reserved.